THE ONLY MARINA serving the upscale resort islands of Kiawah and Seabrook in coastal South Carolina, Bohicket Marina is one of the premier facilities on the East Coast. Bohicket Marina also has some of the best waterfront views in the entire Charleston area, and the real estate market that surrounds it has never been hotter. A recent $15-million renovation gave Bohicket new boardwalks, decking and floating docks, and its 33,000 square feet of retail and office space also received a major face lift. The parking lots were resurfaced, landscaped and reconfigured to add more spaces. Bohicket is changing in other ways as well, transforming rented wet slips into premier Charleston-area real estate and at the same time giving sailors in the Carolinas the opportunity to own their own piece of coastal blue. This exciting change follows a modern trend called the dockominium, an individually owned, rather than rented, wet slip. Ownership guarantees that the slip will always be available and that boaters will have the opportunity to keep their vessel docked in the newly renovated and well-maintained marina. Dockominiums allow modern boaters and fishermen to enjoy their ocean homes while experiencing all the benefits associated with owning real estate. Kiawah and Seabrook property owners who don-t own boats are also purchasing wet slips for deep-water and ocean access, significantly increasing the value of their real estate. Bohicket Marina currently has about 125 dockominiums available for sale. As with most vacation homes, 80 percent to 90 percent of their value can be financed, and the interest is usually tax-deductible if they are purchased through a home-equity loan or if the boat and slip together qualify as a home. Bohicket has reserved 60 slips for long- and short-term rentals, transient boaters, charter boats and tour boats. With a water depth around 18 feet at low tide, Bohicket Marina and Yacht Club can comfortably accommodate yachts up to 200 feet long. Amenities for renters and those who purchase wet slips include a new floating dock system and 30, 50 and 100-amp electrical service. Bohicket also offers many of the same advantages as any resort community. The marina is equipped with freshwater showers, a laundromat, access to free wireless Internet, shopping, boat rentals, charter cruises and a salon and day spa. Whether for a day or an entire season, boaters will feel at home at Bohicket Marina. Bohicket Yacht Club was organized in July 2004 to promote safe boating and cruising and social activities for its members. The Club features a private dining room and bar, is recognized by the United States Yacht Club Association and collaborates with other yacht clubs around the country. The area-s dining experiences are favorites among fishermen and pleasure boaters alike, who get a taste of the area-s local flavor at the Privateer, Fischer-s Sports Pub, Rosebank Café, the Bistro at Bohicket and Cyber Creek Ice Cream Café. Those looking to enjoy the water can take a sunset cruise aboard the Island Breeze, rent one of the new 19-foot Sea Pros with a global positioning system or charter a boat and captain for inshore and offshore fishing. Regularly scheduled cruises depart from Bohicket Marina and cruise past the historic Andell Plantation house, Jenkins Point Plantation and the commercial fishing docks at Cherry Point. As guests cruise further downstream, they will see the shrimp boat fleet at East Coast Seafood, which includes several of the boats that played roles in the movie "Forest Gump." The area wildlife is amazing. Dolphins play alongside while guests experience the historic village of Rockville, a maze of uplands, wetlands, sandbars, creeks and rivers stretched over 550 square miles. 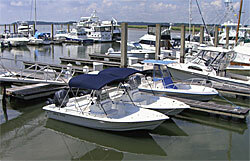 Bohicket offers boat rentals, a favorite among families seeking an exciting day of exploration along the area-s creeks, rivers and beaches, proceeding at their own pace and taking the time to observe dolphins and bald eagles, catch tasty blue crabs, hook an inshore game fish or gather shells on the barrier islands. All rental boats are equipped with safety gear, GPS units and two-way radios. Boaters are also given a complete orientation and charts pointing out local highlights and secret fishing spots. Bohicket Marina and Yacht Club is quickly becoming the center of entertainment and activities for Johns Island, as well as for Kiawah and Seabrook Islands. Once you have experienced Bohicket, you-ll understand why it has hooked so many people with its Lowcountry charm.